Never done a Penny Poll? This simple activity is one way to have more interaction with passers-by about government spending priorities. It challenges each of us to think about how tax dollars are being spent and how we would like them spent. 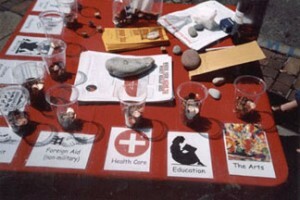 Set up penny polls on tax day outside the IRS or post office — or publicly at any time of year on college campuses or in libraries, at peace fairs, conferences, and downtown plazas. Send out poll results in press releases to local media and you can post them on websites. How do you do a Penny Poll? Although called a “penny poll” some groups use nickels, others use beans instead of coins. Some groups use cups or cut down plastic bottles to collect the coins or beans; some use an assortment of jars; some use matching jars. Others have a member with design and carpentry skills who builds a frame for plastic tubes. The categories on the War Resisters League pie chart serve as labels for the jars or tubes for some groups; others like to add more specific categories and make an even split with 10 categories and 10 pennies representing one tax dollar. The photos may give you more ideas on how to construct your very own Penny Poll. Use your imagination and the resources at hand. Also, see the blog for New York City’s Granny Peace Brigade and their “Ms.Gizmo” for their fancy set up and polling stories. certain countries on the globe and write down their ideas about preventing war. There’s a Peace Wheel of Fortune and a chin-up bar, suggesting that peace takes strength, too. We appreciate seeing how seriously most students approach the challenge. When they walk up to the Penny Poll, they deliberate carefully before distributing 10 pennies among the 5 jars. Over the last semester, in 7 school visits, 234 students voted for 30% of the federal budget to go toward Education, 24.5% for Health Care, 19% for the Environment, 14.8% for the Military and 11.7% for Humanitarian Aid. Lately, we’ve been tweeting the Penny Poll results to the schools’ twitter accounts as we tally up. During our last school visit, one student who unfolded the AFSC’s “One Minute for Peace” graph after she had voted in the Penny Poll said, “Nuclear Weapons? We don’t need those!” Kids should have a voice, and the Penny Poll is a great interactive exercise that can be used year-round. Expect shock when passers by see how their tax dollars are being spent by the government. Photoc by Mary Loehr. Members of New Hampshire War Tax Resistance conducted an informal poll in front of the Portsmouth post office on tax day. 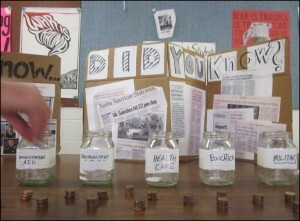 Participants were given 20 pennies to drop in any of ten glass jars, each representing a part of the Federal budget. After 8 hours the results of the penny poll demonstrated the inverse of how our tax dollars are actually spent.